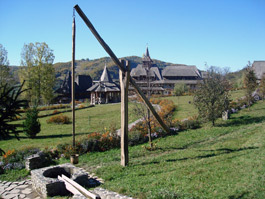 Bârsana is one of the bigger communes in Maramureş, and one of the most important villages in the valley of the Iza River. 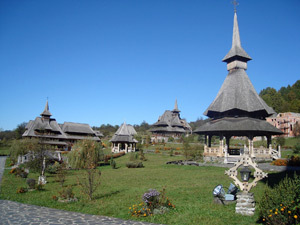 The church, which now stands on a small hill surrounded by an orchard, is one of the eight churches on the UNESCO World Heritage List. Summary: The church is very dark inside. The very small and low pronaos is without any windows at all. The naos is much more spacious, with a high barrel vault, but also here not much light enters. The name bârsan means a shepherd who keeps sheep with thick long wool, and the word became a surname during medieaval times. 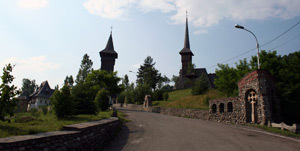 The village of Bârsana is referred to as the property of kneaz Stanislau, son of Stan Bârsan in documents of 1326 and 1346. The monastery had by that time existed for some centuries, for a document of 6 November 1405 mentions a field of the monastery. 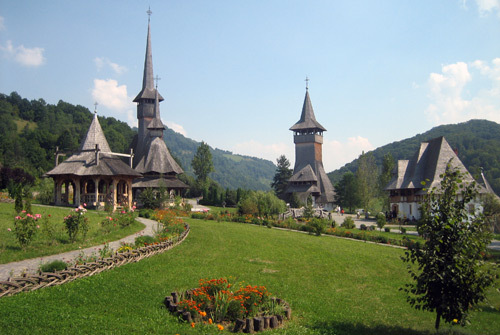 The church was used for monastic purposes until 1791, when the monastery was abolished. In 1802, the villagers decided to move the unused church to the middle of the community. The entrance to Barsana Monastery. 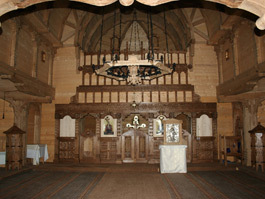 The church was built of thick beams of oak on a foundation of massive blocks of stone. It has a rectangular plan, with a polygonal chancel apse, which is slightly narrower than the main body of the building. On top of the pronaos rises the tower, which is not extremely tall, but still gives a graceful air to the whole. In front of the west façade, there is a porch on two levels, each with pillars that form rounded arches. The porch was added in 1900. The roof with two eaves covers the main part of the church, while the roof covering the chancel is lower and with only a single eaves. The heavy roof is supported by consoles, the ends of the upper beams of the walls, cut to decorative shapes. A carved twisted rope goes around the church just under the small windows. Scenes from the side of the vault of the naos. 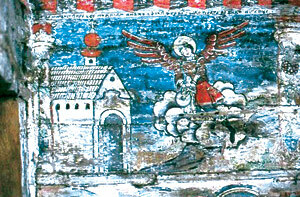 In the middle is St. Elijah and the Chariot of Fire, where the saint is shown ascending to heaven. The naos is much more spacious, with a high barrel vault, but also here not much light enters. There is one bigger window low down on the south and north walls, and two smaller ones on each wall, high up between the two eaves of the roof. The chancel is again a lower space with three small windows, one to the north, east and south each. Even though the windows are still very small, they were enlarged in 1900, at the same time than the porch was added. Due to this, the mural paintings around the windows were destroyed. An inscription in the naos says that Hodor Toader painted the walls in 1806. The paintings were done on pieces of textile fixed on the walls and covered with a preparatory layer of limewash, as was usual during that period. Archangel Michael Saves a Child from Drowning, a scene on the north wall of the chancel. The scenes, especially in the naos and the chancel, have been influenced by baroque and rococo styles, which started spreading in Transylvania during the last quarter of the 18th century. 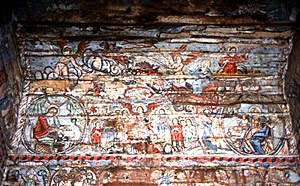 The painter has used medallions for the scenes on the walls, but the vault of the naos is treated without any constraints. The luminous feeling is created by the dominating colours of white, blue, red and golden ochre. 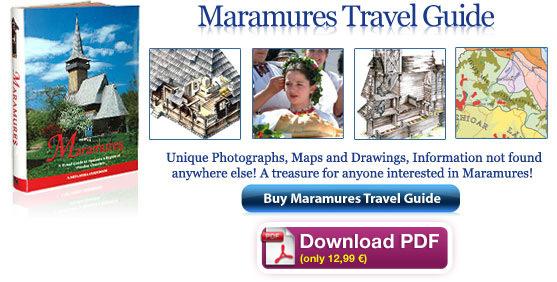 It was especially the quality of the paintings that concluded the inclusion of this church in the World Heritage List. Such a beautiful place. Gorgeous! 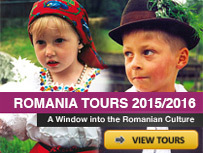 The best village of Romania !